NYC, 04/13/2019, 2:00PM. Strangers on a Train (1951): Oscar Nominated Psychological Thriller Film-Noir By Alfred Hitchcock. A psychotic socialite attempts to force an amateur tennis star to comply with his theory that two complete strangers can get away with reciprocal murders. 101 min. Director: Alfred Hitchcock. Starring Farley Granger, Robert Walker, Ruth Roman. 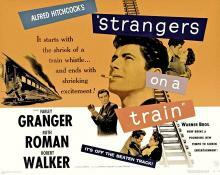 The movie is based on the 1950 novel Strangers on a Train by Patricia Highsmith. Strangers on a Train has an Academy Award nomination for Best Cinematography.